Visit each of our design team member's blogs and make a note of the sponsoring company. After you know all 12 companies visit the Epiphany Crafts Facebook page at http://www.facebook.com/pages/Epiphany-Crafts/138008244814 and leave a comment on the Card-A-Palooza thread listing the 12 companies (abbreviations are okay) and you will be entered into the drawing for a GIANT prize package. You will be receiving product from each of the sponsoring companies plus tools from EC. Best of all, you will be receiving the 12 handmade cards shown on the blogs, all ready to use throughout the year. This is a huge giveaway that you won't want to miss! Tattered Angels is one of the sponsors :) I used their Glimmer Mist dewberry on my card. I love the way it makes everything sparkle, perfect with the epoxy shapes!!! For my sentiment I printed out Congratulations, used Epiphany Crafts Shape Studio Tool Round 14, to turn it into a charm I glued it onto a word charm. Thanks for stopping by! To be entered in the huge giveaway make sure you leave a comment on Epiphany Crafts' face book page. The next stop on the hop is Tracey Taylor! July: Joy Hager You are here! Such a great card, thank you for sharing it with us! Just hopping on by on my 12 blog hop journey. Very cute card thanks for sharing. That card is wonderful! I love the charm as a little extra touch! Cute card. I'm really enjoying all the styles I see on my blog hop! OH no I cant see the pic!! I am sure that it is great!! but the pic is out I will check back to see it !! Love the card. One of my favorites so far. REally like the colors. Really beautiful! 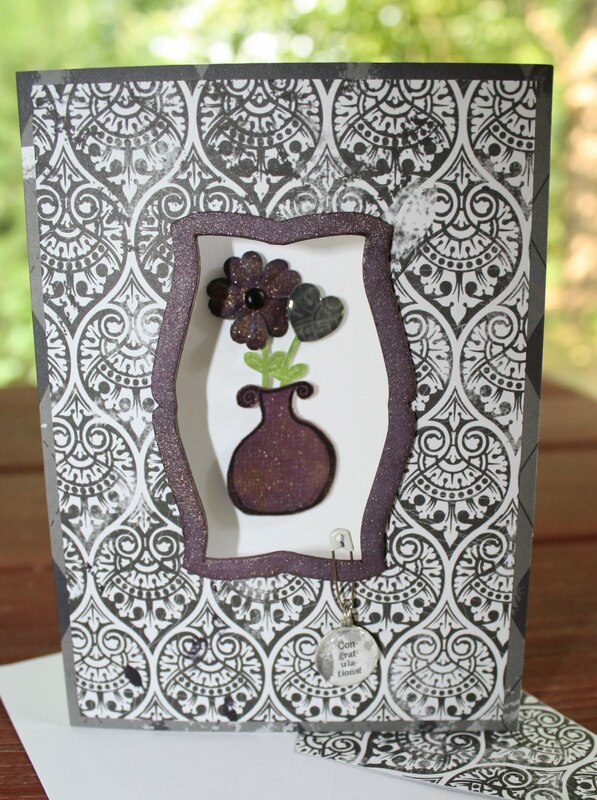 I love that dewberry...the colors in your card are lovely! beautiful card. I love the mist, I use it on tons of my pages. Wonderful card, I adore TA!! This is just such a nice card, I love the sparkle and that congrats charm is perfect. Thanks for sharing! Great job using your Tatterred Angels! The flower and heart in the vase look wonderful! Your card is just gorgeous. I adore chocolate brown and you really made it sing. I love your card...I can see using it so many ways. Thanks! Love that card - especially the cutout window! Awesome card! Love the design!! !